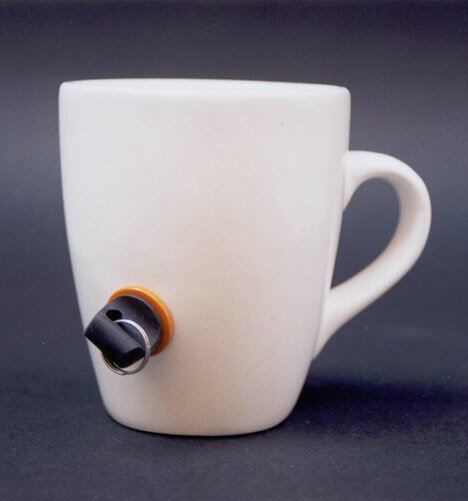 Prevent Mug Theft With The Lock Cup | OhGizmo! By Chris Scott Barr on 07/10/08 • Leave a comment! There are plenty of reasons why I don’t drink coffee (the taste being one of the larger reasons). Since I don’t drink the stuff, I don’t worry about anyone running off with my coffee mugs. However, in some offices this is a real issue. People will knowingly take your cup, fill it up, and take it back to their desk. Sure, you can confront them about their blatant disregard for your ownership, or you can get a better mug. The Lock Cup features a peculiar hole in the side. Naturally no one will want to use a leaky cup (and if they unknowingly do so, they’ll be in for a hot surprise), which takes care of the issue. When you’re ready for a cup of Joe, just insert your handy key to plug the hole, and you’re good to go. Just make sure no one throws your seemingly broken cup in the trash. Alas, this is merely a concept design for now.